oh dear goodness my little faeries. the week has gone by oh so very quickly. like a shooting star. quickly quickly to climb the work mountain, i took a shortcut in the end. there has been sweets. scary films. charlie and lola. toffee apples. paper snowflakes. paper sprinkles. dissertation writing. tea. christmas countdown. sleepless nights. the christmas with my friends whom i live with at uni, with gifts and christmas dinner and bunny crackers and christmas songs and dances. the christmas at our flat included such beautiful gifts. chocolate hearts. teeny ladybug pegs. the cutest post-it notes. pretty pencil with rubber and colour pencils. mouse decoration. mug. hsm glass. german chocolate teacake. sugared piglet. pink pegs. jellyfish pencil sharpener. they are all so beautiful. my moon best friend rosie sent me the most adorable and utterly wonderful mail. our secret fairy mail. it was filled with a homemade photo frame for pig with his favourite picture inside. tilly~rose got the cutest teeniest wooly hat. which she adores. the most perfect little homemade book, full of magic and sparkles and perfection. and a wonderfully cute, too cute to even use the word cute....brooch. it is a spectacular. thank you, you wonder. i cannot believe i am finally home at the cottage. it is beautifully christmassy and full of love. oh christmas souls.... four whole days. can it really be true? i have filled the days up to christmas with all sorts of exciting plans and adventures. 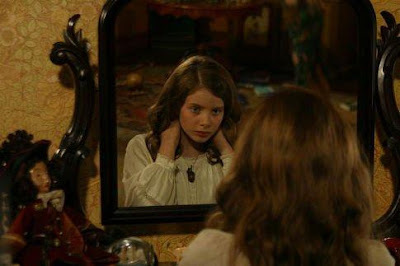 sunday i meet my beautiful fairy emmeline. to exchange our homemade gifts. monday i help father buy a couple of last minute gifts and then up to the haggerty house which is filled with cousins and cousins and chickens. we have the snow wish. tuesday we all go ice skating. a celebration for fraser's birthday. oh all my cousins are growing up too completely fast. wednesday.... christmas eve. home baking, wrapping gifts with paper and ribbon and magic, watching polar express with mother and samuel. emmeline's home made gift includes giant cupcakes with butter frosting and sugared flowers for faeries. and some homemade vintage-button earrings. i cannot wait. we are meeting for starbucks, christmas drinks. yesterday was full of cake baking and lazy days and tilly~rose snuggles and whisper mail and christmas wishes and creating magic and listening to christmas songs. and peter pan. aw my dear.... this made me giggle and grin so hugely when the wonderfully creative notebookdoodles gave me this. but then to hear the romantic dreamer the drifter and the gypsy and the cutest and sweetest the yellow elephant have given it to me too.... wow. my work mountain was made so much easier. thank you. you are all so very wonderful. in return... i will make my special award. one that i wanted to make a while back. i will make the snow wish for you too. all of you. so we can make snow angels and faeries and rosie can make stars. ....it's sunday. i had butter icing for breakfast. ssh. I love the Peter Pan film. And your presents are simply absolutely lovely! Such lovliness. Congrats on the award, I got it too and its so sugary pink, I love it. thank you for coming to see twilight with me! your house looks wonderful at christmas! beautiful tree! Your plate of candy looks delicious and you are such a loveley lovely girl! Lottie Lottie Lottie~ Miss you and little tilly-rose loads too!It's so glad you're back in your little cottage! You seem enjoy your Christmassy holidays a lot!Candy cane,gummy sweets,Christmas presents,Christmas tree,warm fire place..Ou,tilly-rose seems adores very much its wooly hat.It's so cute!I love Peter Pan film too!They are lovely couple,aren't they? What I wished for? Yeah,I wished for some snow too!>.< Hmm..I wish..everyone enjoys their Christmas and puts on a happy face!^^ Happiness will full-fill in everyone's heart warmly!How about you,Lottie?What have you wished for? Seems like you are preparing for Christmas in the most wonderful way! Full of magic and wonderfulness. 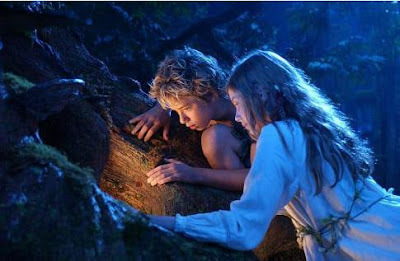 I love Peter Pan as well, such a nice film! The Magic Spirit of Christmas definitely lives in your house and in your heart. You seem so happy and excited it akes me smile. I hope you had wonderful days with your family and continue to have such magical projects and plans for the days to come. Oh, if only Christmas could be all year round! i never know what to say in my comments for the reason that there is so very much i want to say & am feeling. your magic is contagious. i love that your life is full of dainty simple pleasures, of imagination, of connection, of cupcakes & teacakes & sweet things, of tea everday, of the pink & the sparkly. you are one of a kind. thank you a thousand times over for sharing your loveliness & festive cozy holiday magic with me. i always feel glittery & warm after reading your posts, no matter how blue my day was. i'm snowed in now, but happily so, for the world is so beautiful. and i have more reason for lighting candles & cuddling with my siblings & listening to soft music & baking for the aroma & warmth & deliciousness. I agree, I think it was a Christmas MIRACLE to get your package in time! I worked out the cost of your package and it only cost 3 dollars, so that is really really good. Its not my best, I didn't make too much of it... I pinky swear to send another small something after New Year's. But Yes I LOVED my special gifts! They were fantasticly magical.. <333 They are so adorable and displayed everywhere in my room. Thank you about the snow! And aww dahling thank you, for calling me 'brill...' In that case, you are 'fab!' Love you, big kisses and snowflakes! hey.. if you'd like some of my doodles, leave me your address on my email: notebookdoodlesblog@gmail.com and i'll try to get something to you!! aww its fine love !! well later i'll be posting something yo could help me with if you want ! hows your chistmas shopping gone? ahh peachy cream tights souund lovely. btw i am still majorly in love with your blog. you are soo inspirational. i know this sounds weird but sometimes i see things and think of you haha. do you have an email? So many pretty things in this post, you are a true beauty. How cute does tilly~rose look! The tree looks lovely, and the snow globe. Sounds like you have lot's of amazing things planned for christmas! ahh lovely, charming post as always! and those earrings are adorable! Oh, have a lovely time being home! Enjoy every minute of the cosy cheeriness of Christmas and its preparation. i love love love your blog. it is so sweet and all your pictures make me smile. happy christmas darling! I love your blog! you are adorable, but you make me want to eat lots of sweet things all the time.lol. I have tagged you, hope you don't mind, it's a pretty sweet. your photos make me feel warm and fuzzy inside! chocolate hearts, post-it notes, sweets, toffee apples. paper snowflakes and paper sprinkles. oh i was so happy this morning when first thing i opened my computer and saw this post. oh so full of christmas sparkles and holiday delight of pink and sugar and sweet home love! and then a comment from you too, which means so much to me. i don't know what else i can say to show how wonderful i think you are... so i will just say merry christmas! and thank you thank you for putting your loveliness out in the world. Wonderful pictures! Those cupcakes look so pretty and yummy! your presents look delightful, as does your tree, as does tilly rose, and as do you! can you believe that it's only 3 days till christmas. and that for me means 2 days until my birthday haha. i'm so excited for both, to see all my friends and family and see them rip open their presents, and hopefully like what i've gotten them. that look of happiness and content with a good present is one of the best in the world, isn't it? your lovely comment was most sweet. oen day i shall really dress up in a tea dress and wellies and a garland in my hair, and eat turkish delight, drink iced tea and generally be silly. a big house filled with books and history, some kind of forest or wood nearby to frolic in... it would certainly be lovely, wouldn't it? that kind of life... now that is my christmas wish for this year. oh everything is so sweet and cute and i love it. the presents, the sweets and everything else is just so wonderful and not to mention the christmas spirit that lives in your heart and your house. PPS-Check your MSN I left a message in response! lottie m'dear how i've longed for an update from you! & tell tilly hello for me! sweetie! i happy you are back in the cottage, and that you feel all cristmassy! i do myself... the pictures, all of them, are oh, so so sweet. the persons who get your presents, are lucky. all the presents are adarobale! i hope you get the most fantasticaly and magicaly christmas holiday, and i hope all your dreams come true! Happy christmas, dear you! i have added you! look forward to talking to youu! merry christmas, if i don speak to you before ! wow~what a lovely post to read! i am so excited to wrap presents now! your tree is really pretty. i hope you have fun with your family! I am not one for apples, but that candy covered one looks enticing. And also, that Peter Pan movie is a delight. I watched it just the other day. Had completely forgoten about it, actually. But yes, a great version. Your cupcakes look scrumptious! Merry Christmas to you Lottie!! Thankyou for your lovely comment on my blog! Sadly I'm moving all the way to New Zealand next year some time... Edinburgh rock sounds sweet though, yummy. awww....isn't that the cutest little adorable blog award EVER?!?!??! you totally deserved it. your gifts look so lovely! everything is so girly and charming. just picturing tilly~rose in that tiny hat is too sweet. she is a doll. it makes me smile that you are happy at home! there is no happier place to be at christmas. those frosted cupcakes look delicious. makes me want a treat right now! but it is too late. i will wait for tomorrow afternoon. your pictures are always so happy! omg... your blog puts mine to shame...lol. I just started it, but whatev. I love yours and I also think it's amazing that you're a fashion student. Kudos! Oh your week so sound lovely, all of it, maybe not the scary films because I am a huge scary cat, but it all sounds wonderful indeed. Those gummies and little candies do look rather yummy. Charlie and Lola? Some other pets of yours or actual friends whom I am mistaking as pets? That sprinkled apple looks delicious. I have had one of the best ones in Disney, it was filled with so many goodies, and many fattening treats, but there is always a time to care about your weight and always a time to not give a thought in the world about such a thing. That was a moment were I did not think of it. Your treats, make my mouth water, hhhhmmm. Your hair in those pictures is so lovely. The color is such a beautiful color, and your smile is so pretty and real. You are a very pretty girl. I hope you get home safely and have a wonderful time, filled with many smiles and laughs, hugs and more delicious treats, and much more smiles. That picture with all of those little gifts, I assume, is so cute. The bed sheet is an adorable color by the way, with the flowers. Very cute. Ehehe the octopus is so funny and cute, as is the little bear/puppy looking thingie. I love notepads like the heart shaped one; they are so fun to leave little messages for your friends and families on it, something to make everyone smile when they see it, no? Oh and pretty pencils make me feel so unworthy of using them, I feel terrible when I do. Oh it is a mouse, not a bear or a puppy, sorry. And ajelly fish, not an octopus, wow am I wrong today. Hehehe so sorry Mr. Jelly fish, or is it mrs? A family reunion, the best way to spend a day. You have such great plans, I am sure you will be so happy this whole week, and you deserved it after working so hard in school. hehe you have chickens? That is too funny. It is a cottage? Like an actual cottage? Oh I love ice skating, though I fall often because I am not used to it, but it is still wonderful. It also gives me a reason to hug my friends. Hehehehe how silly of me. How old will your cousin be? I do enjoy that movie quite a lot, they have been passing it for 2 days straight though, which makes it lose its charm. That snow globe is so adorable, I see the snow man, how cute it is. And the decorations for the tree are also adorable, as is that white star there. Yum! More cupcakes, how delicious. Those little earrings are so very cute and adorable, they will look beautiful on you. Oh I love Peter Pan, though I did not like it when he was mean to cute little Tinkerbelle, though she was plotting against him. So dear at the end when they are all saying “I do, I do, I do believe in fairies!” it was wonderful. You deserve that award, so much. Yes, indeed you do,. You have one fo the best blogs, which cheers me up to just read it, makes me feel lovely to talk to you and just know you. You are a wonderful person and friend dear.. I hope you have a wonderful week dear, filled with many gifts and bows and cute little notes. Many smiles and hugs too. by the way, your blog is pretty much sweetness. Lottie! It's Christmas eve already!! I'm so excited! Let's have the countdown for this special moment! >.< I can't wait! Merry Christmas Lottie! I love Peter Pan, and The Polar Express! All your presents are simply gorgeous. Hope you have a fantastic Christmas! Your pictures are ALWAYS so lovely. And not to mention, so are your entries! hello, i found your blog through unicorn diaries, and i like the glitter and sparkle and words. i'll probably follow it now. Oh lovely!! Merry merry Christmas! I hope you are having the best holiday ever.